Fly fishing for bull trout is some of the most exciting non-anadromous fishing to be found in North America. Bull Trout aren't actually trout. They are Char, which are closely related to trout. Char have light colored spots on a dark background. Trout have dark spots on a light colored background. There are other small differences as well. Char normally have smaller scales than trout. There are five species of Char native to North America: Arctic Char, Brook Trout, Bull Trout, Dolly Varden, and Lake Trout. Bull Trout are native north of the Mexican border, west of the Rocky Mountains, and as far north as southern Alaska. The world record Bull Trout was caught from Lake Pend Oreille in Northern Idaho in 1949. It weighed 32-pounds. 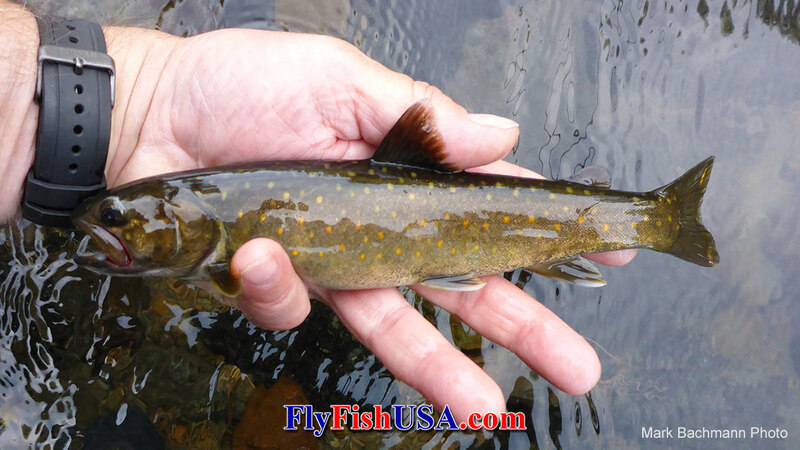 Bull Trout are incredibly powerful and challenging fish making an angler give his best to land them. They are some of the largest growing freshwater salmonids in Oregon, Washington, Idaho, Montana, and British Columbia. Because of their size they are often fearless, taking enormous flies with reckless abandon. Here are some insights into how you can set yourself up for success when chasing the elusive Bull Trout. Tackle can range from a 9’ 6wt all the way up to your standard winter steelhead setup. Single hand rods, as well as Spey rods both have their place. Single handed rods cast overhead are much more efficient for delivering bulky 4-9” flies that would be difficult to cast on a Spey rod. Where back casting room allows, 6-8wt rods in the 9-10’ range are perfect tools for chasing bull trout. A large arbor reel for quick line pickup paired with a sinking line system such as the Rio Cold Water Outbound Short, and Jim Teeny T-Series (soon to be available again) are great choices. 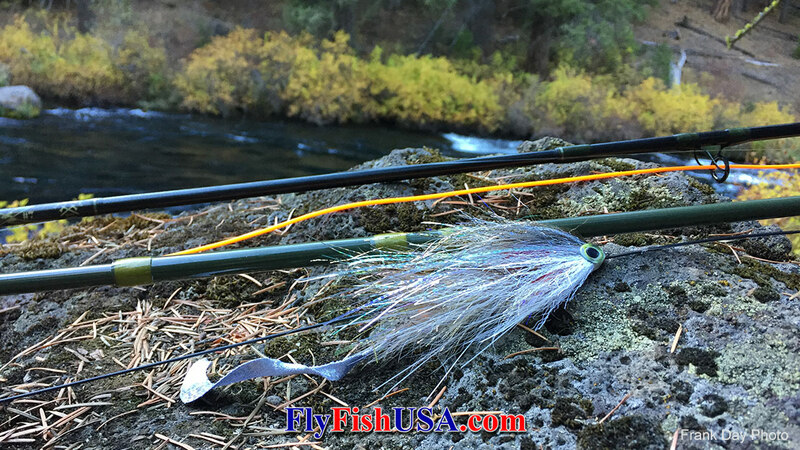 Spey tackle is excellent for swinging flies to bull trout. For modest size flies that are sparse enough to be delivered on a water loaded cast, a Spey or switch rod is a great tool. Where there are juvenile bull trout and smaller resident adults to 23” a 3-4 wt trout Spey is a perfect tool. In waters with adfluvial bulls coming up out of reservoirs it’s a different story. Some of these fish can exceed 20lbs. The fish of a lifetime can come at any time and it’s best not to be undergunned. 10’6”-13’ 6-8 wt. Spey and switch rods are excellent rods. Skagit line systems are best. Triple density Skagit heads such as an Airflo FIST are best. Sink tips will vary but generally 10’ of T-11 to T-17 is the best choice for the deep swift waters bull trout thrive in. For both a single hand or Spey setup I would recommend fluorocarbon leader. Bull trout generally live in the coldest cleanest waters, so water clarity is usually quite good. Although they are a big and aggressive migratory fish, they are a lot like steelhead in that it only takes 1-2 encounters with an angler to make them extremely wary. Fluorocarbon has a refractive light index almost identical to water and becomes nearly invisible when submerged. Not having a visibly tether attached to your fly will always put the odds in your favor in clear water. Fly selection is always a fun one when it comes to bull trout. If you are a fly tier this is your perfect fish. That 9” quadruple articulated flashabou monstrosity you want to tie? A bull trout will eat it no problem, sit down at the vise and let your inner Kelly Galloup go wild. Large olive and white or olive flies to represent juvenile trout and whitefish are very popular and will probably get some of your most memorable eats. The most popular fly design is the Dolly Llama. Big flies however, aren’t always the end all for bull trout. Often time’s smaller flies are overlooked. A simple size 4 Sculpzilla is an excellent choice. Smaller Clouser Minnows are also quite effective. The new Perfect Prom dress series is also a deadly effective smaller fly for bull trout. As fishing pressure increases as adfluvial bulls make their way home, larger flies become less and less effective the more they see them. On a recent trip my friend watched 15 or so bull trout that were not grabby fish in any sense of the word. The tailout they were in was littered with broken off streamers and looked like a Christmas tree. The bull trout in that tailout let multiple 8-9” dying Kokanee hit them directly in the face as they feebly fluttered downstream. None of them even attempted to eat one of the Kokanee. We left those fish alone out of pity but a small sculpin might’ve done the trick for a number of them. Surface feeding is also a well documented bull trout behavior. The unwary mouse or shrew is often times slurped under by an aggressive bull. Fishing with a Mr. Hankey at first and last light can produce some very memorable eats. Adult Bull Trout like their food in big bites, so the majority of their food is other fish. But, young Bull Trout up to about 16-inches in length often feed very much like rainbow or cutthroat trout. Their diet is mostly aquatic insects. Sometimes young Bull Trout are caught while fishing dry flies. Bull trout are highly predatory fish. Many highly predatory species are fished for in the morning and evening. The major and minor of the daily lunar cycle are highly influential on predatory behavior. I used to not believe it until I would look at when fish were caught and when the major or minor was. The results were quite correlative. Big predatory fish feed on the major and minor and knowing this we can use it to our advantage. 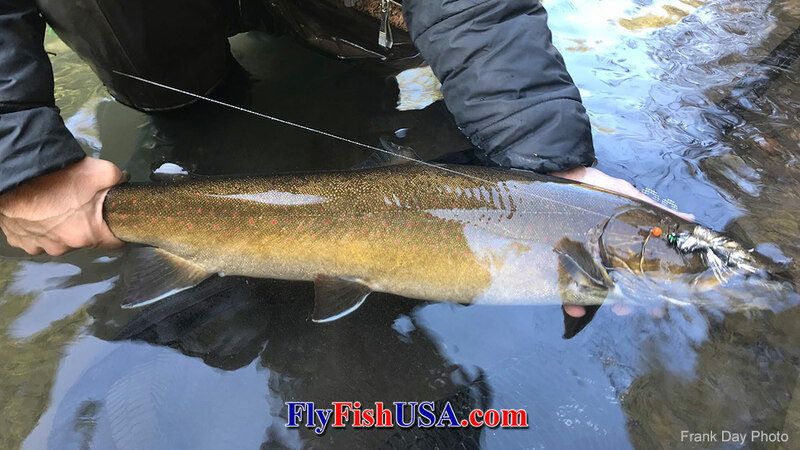 Often times when large bull trout show themselves but don’t commit in the middle of the day, marking that fish’s lie in the pool and then returning on a major or minor of the moon can get that fish to commit. It’s systematically arriving at the right time to fish the right place; a very coordinated well thought out plan puts more big fish in your palm. Swinging flies is quite effective. Downstream casts that come across are a great way to search for aggressive fish through new water and cover a “grid” by stepping downstream. This works for the more aggressive fish willing to chase down a fly. It is not the end-all presentation however. As steelheaders and salmon fishers we tend to only think "down and across". In the world of big meat eating trout, upstream casts are often forgotten. Wounded prey items almost never travel back upstream. They are swept down until they can work their way into slower edge water. Casting a fly upstream and retrieving it downstream with twitches or strips is a great way to appeal to lazier more ambush oriented fish. Often times these fish are larger. Their calorie loss to calorie intake is at a higher yield than a fish that chases prey down expending more energy. These types of choice ambush lies are hard earned by being the biggest, baddest trout in the pool. Broadside, and grease lined presentations are a happy mix of both. A broadside swing presents sideways to the fish showing the full profile of the fly as well as accelerating out to the bank after coming downstream a ways. This is a great way to swing a tight line and replicate a wounded fish. If there are twitches or pauses thrown in the mix it can be even deadlier. 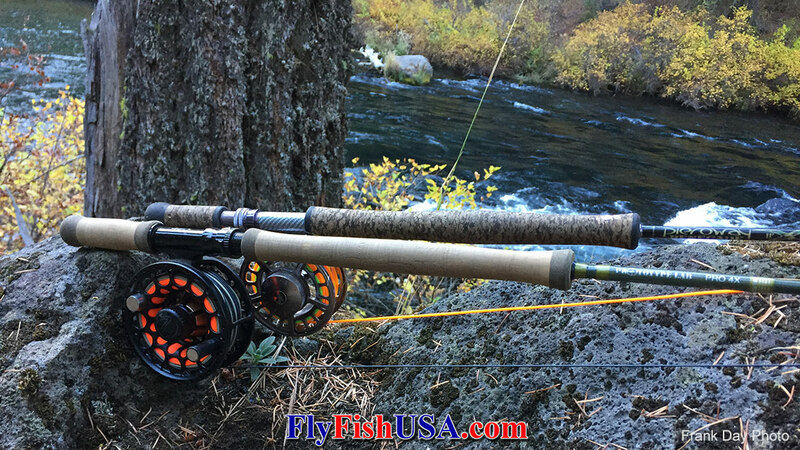 A grease line presentation has typically been used for fishing dry flies to salmon and steelhead. It employs downstream mends to dead drift a fly down a choice current seam into a swing at the end. This is perfectly replicable in a subsurface manner with a sink tip and/or Skagit line. When you are fairly certain of where the fish is holding a dead drift down to it will allow the fish time to assess the fly and if any part of the fish wants to eat, it will be forced to commit as the fly starts to swing out and accelerate away from the fish. This can result in one of my favorites; the downstream take. The fish tracks, turns and eats the fly going downstream and you get the full weight of the fish’s downstream acceleration coupled with the current. All that velocity going the opposite direction from you results in a pretty serious grab.